This is a work in progress... I am hoping to complete her tomorrow... I ADORE painting on canvas... this is a JOY! Ok... back to work! Still have to finish a room design... and paint for Penny too! Could I get a few more hours in the day please! Do you need more hours to your day? Or perhaps you need an assistant or better yet a clone of you? Have I told you that I love your work? Oh yes, many many times I guess. But I really love it! I never thought about the difference the background paper would have with the same medium as paint. You should teach us more about this "art stuff." 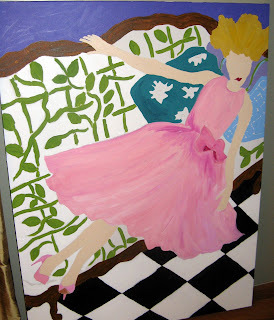 I love that you've showed the process of your painting in progress. It's fun to the see the "order" of it, and how it all comes together. So neat - I love seeing your process first hand! It is fascinating to watch the process in which you choose to paint. Starting with the green and finishing with the actual woman. Well there is no doubt that whoever commissioned it is going to be thrilled when you get it completed. How very fun for you and them! I am so excited about my piece!! I am in love with your painting. I love wearing pink and I sooo love to make pink desserts. It is so funny, we have the black and white tile in our kitchen and going all the way to the front door. It looks good being flanked by the wood floors. So your painting will be perfect in my home! LOL! Love this painting!! I love the effects of both....canvas and paper. You are very talented, Ms.FIFI!! Just beautiful dear Fifi! Don't work too hard - my weekend cyber escape will be just up your alley! Waw! Gorgeous pictures! You're so clever! I love your way of painting! You must do exhibitions worldwide!!! Good luck! So perfect! She's delicious! You have done it again! So very pretty! I love your work! Amazing! You are so talented. WOW! She is GORGEOUS! I love the couch too! On canvas she looks AMAZING!!!! !